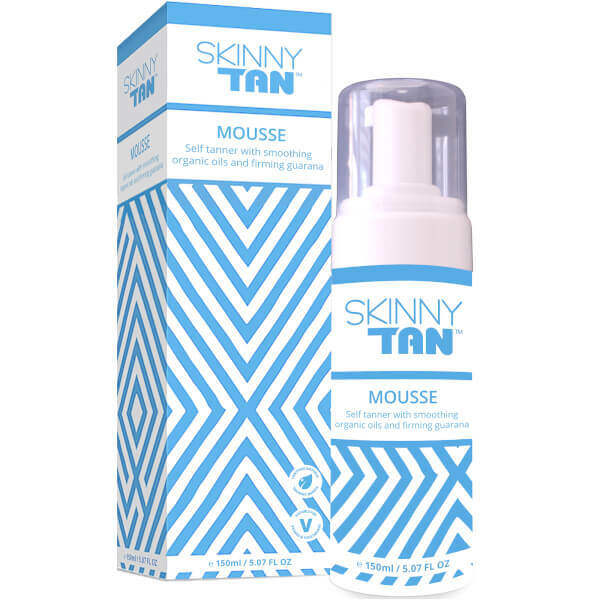 Achieve a flawless, streak-free tan with the SKINNY TAN Mousse; a convenient tanning foam that delivers long-lasting results. Working on both the face and body, the fluffy formula guarantees an enviable tan, without an unwanted orange-hued finish. 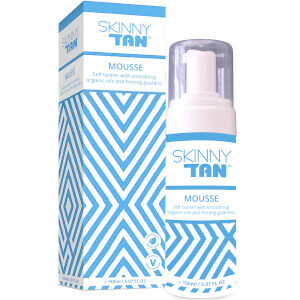 Enriched with two, certified natural tanning ingredients, the lightweight mousse quickly and effortlessly glides over skin, offering a sun-kissed glow that can last up to fourteen days. The self tan also boasts organic Aloe Vera and active Caffeine, which ensure skin is thoroughly and comfortably hydrated, whilst perfecting the face and body by reducing the appearance of blemishes and cellulite. Finished with a fragrant dose of organic Coconut, the tanning mousse leaves skin beautifully bronzed and smelling delicious. Start by adding a small pump of Mousse either directly onto the skin and working into the roller or mitt as you go, or by applying directly to the roller or mitt before applying to your skin. Make sure all the skin you want to tan has now been bronzed. Aqua, Dihydroxyacetone (Certified Natural), Aloe Barbadensis (Organic Aloe Vera) Leaf Juice, Glycerin, Ethoxydiglycol, Paullinia Cupana (Guarana) Seed Extract, Erythulose (Certified Natural), Cocos Nucifera (Organic Coconut) Oil, Dimethicone, D-Panthenol (Vitamin B5), Decyl Glucoside, Caramel, Carrageenan, Ethylexyglycerin, Phenoxyethanol, Sodium Metabisulfite, CI42090, CI19140, CI16035, CI17200, Parfum, Cumarin, Benzyl Alcohol.